In episode 8 of Atlanta‘s first season, “The Club” we meet Marcus Miles. Earn lands Paper Boi a club appearance worth $7,500 but collecting the cash is easier said that done. Alfred is upset because there’s no brown liquor and of course he’s there on the same night as NFL player Marcus aka Jeff Miles. 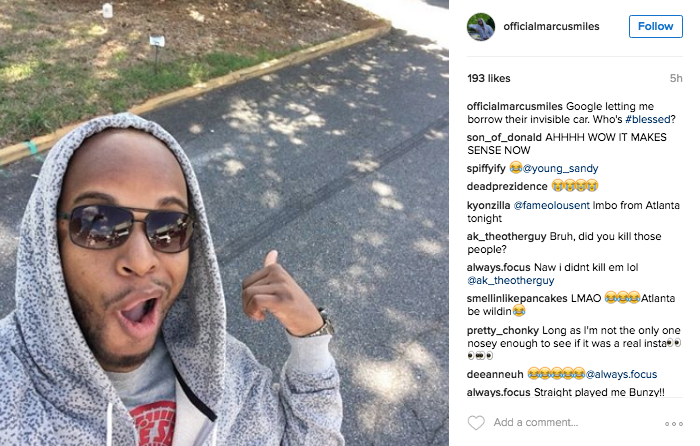 Later, Marcus runs someone over in his invisible car. The cops are investigating the incident along with Paper Boi “stealing” the money from the club owner. The show’s social media team has been brilliant, as proven by the post above. FX is owned by Fox, explaining the success of Empire and Atlanta‘s social media strategies.